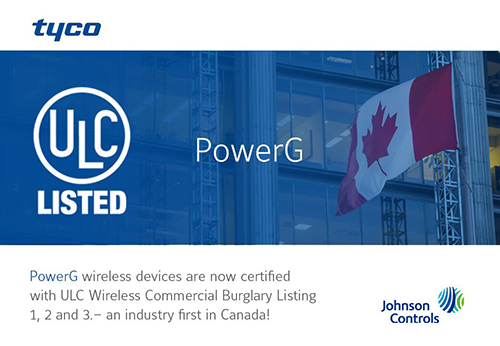 MILWAUKEE – (April 11, 2019) – Johnson Controls has announced that PowerG, the leading security technology with all the benefits of wired security, but without the wires, has achieved the top levels of Underwriters Laboratories of Canada (ULC) certification, making it one of the most reliable security solutions in Canada. PowerG wireless devices are the first to be certified with ULC levels 1, 2 and 3 Commercial Burglary Approval (ULC-S304-16) when installed with PowerSeries Neo or PowerSeries Pro security systems. From their long battery life, superior range, and modern product designs to the full suite of solutions they offer, the ULC Commercial Burglary stamp of approval means PowerG products have met the highest standards. This ensures customers are provided with safer, smarter and more secure products with end-to-end encryption. PowerG’s proven robust anti-RF jamming design and 128-bit AES encryption offers an exceptionally high level of protection against digital attacks. "PowerG technology provides customers with the security of wired technology but the convenience of wireless," said Jennifer Doctor, senior director of Product Management, Tyco Security Solutions. "In the long run, it saves users money and time with simple installations, scalability, and reliability. This industry first ULC certification in Canada is a testament to the potential of unwired systems, and we are thrilled to be leading that charge." All existing inventory with PowerG transceivers and devices are automatically covered by this certification.